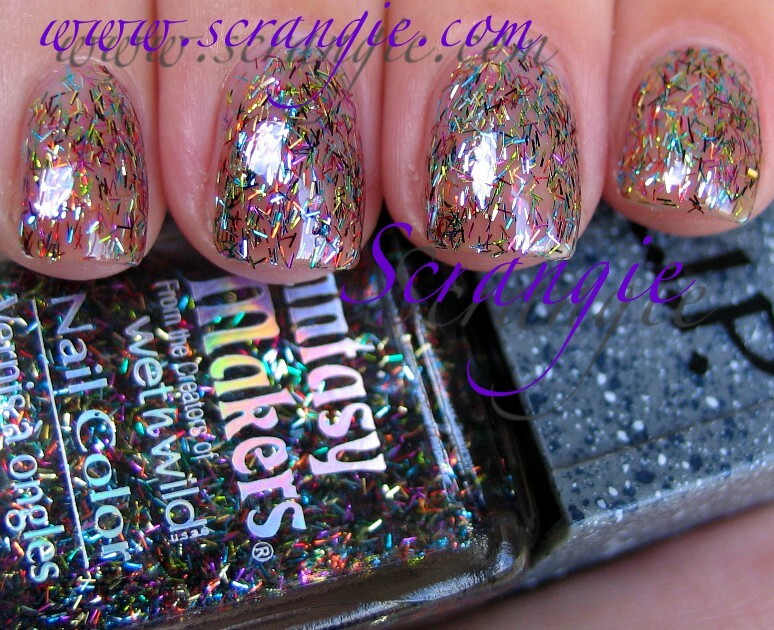 Speaking of bar glitter, here's one of my favorites that I dug out of my stash to wear the other day... Appropriate, too, because I just spotted this year's display of Fantasy Makers polish and now I'm really in the mood for Halloween. One coat of Black Magic over black. That really makes the colors pop, doesn't it? That's one reason why I love this one so much. Bright fun colors with really unusual glitter. This is the old version (2007? 2008?) of Fantasy Makers Black Magic. I'm not sure if they did a color called Black Magic before this one so I'm hesitant to call it the original Black Magic, but this year there is another version so I have to differentiate them somehow! This year's Black Magic is still cool, but nowhere near as cool as this one. Colorful stringy glitter in a tombstone shaped bottle. Fantasy Makers, I love you so much. Gah. geez! love love this!!! So prettyy!! Lindo, eu usaria até durante o dia mesmo. Beijos. I wish I had this! I found this years display yesterday but not everything was out so I had to dig through boxes. I think I like the new version of Black Magic a little bit better. 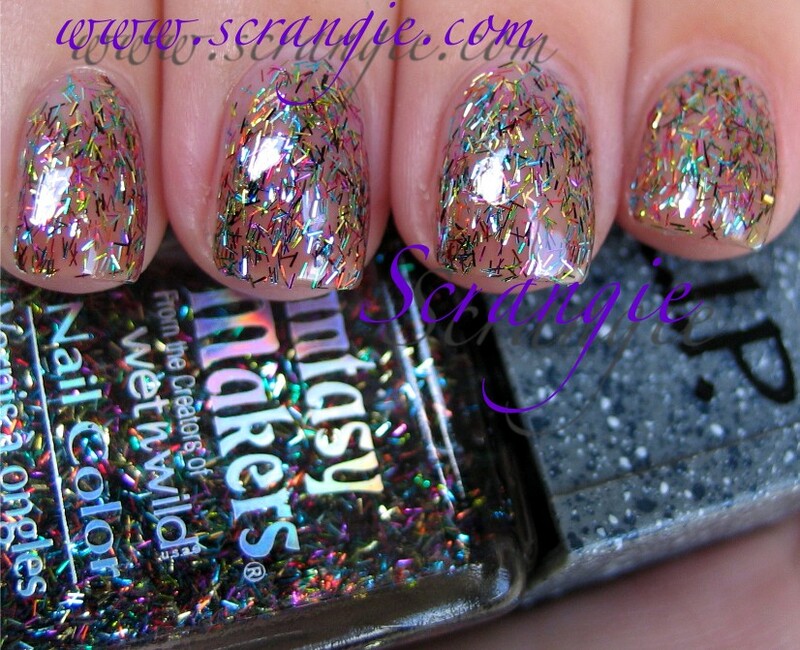 Not that bar glitter is that bad, this just doesn't seem "Black Magic" at all to me. That aside, it is indeed very hard to come across a good bar glitter polish and part of me still wishes that I would have picked this one up. HAHAHAHA barfy. lol This looks great over black! I love this one sooo much. 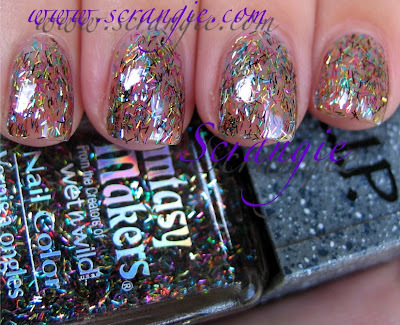 I agree, this is one of the coolest bar glitters. Why don't they make these in diff colours? Wish i had some 45224 more bottles of it. What a great bar glitter! I saw a display of Fantasy Makers this year and there was only space for 3 shades - a glow in the dark, a red/black, and an all black cream. Did not see any bar glitter at all. I really like bar glitter. It also seems to be easier to get off when I get to scrubbin'! This is the only bar glitter I own, and I absolutely love it! Found mine at the Halloween store last year. I am in the UK and sooo want this polish,anyone know where I could buy it and get it shipped over here?